Rebtel Computer Calls : Make Phone Calls from Laptop | Free Pc to Phone Calls, Free Voip Calls to India International ! If you talk about voip then what comes to our mind is Skype. But do you know that Rebtel is also liked by large number of people and it has become world's second largest voip provider. It has been very popular on this blog. 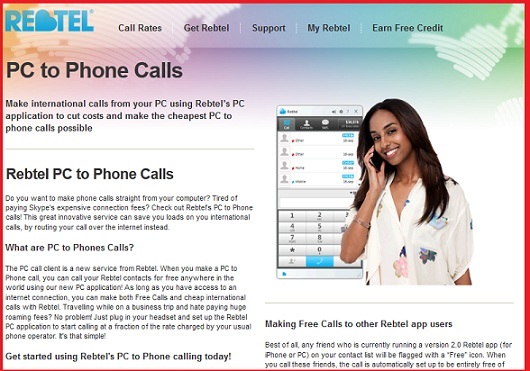 Last year, Rebtel launched many promotions offering very cheap international calls. It time to time offers new voucher codes like double money where you can get twice the credit you buy. The general method of calling it offers is that it offers a local number for each of your contact, dialing which you can connect to your friends and family. Now suppose, you don't have a Mobile, landline phone and still want to make calls using Rebtel. (This situation is quite common with Indian students living in USA and not having any mobile or landline). The only option you have is making calls using your laptop (which I suppose everyone has). Rebtel has recently launched computer calls, using which you can make cheap international calls without the need of a mobile phone. The good thing is this service can also be used from the countries where Rebtel does not provide local phone numbers (like UAE, India etc). Currently Rebtel does NOT itself offer any PC application, so they provide a sort of workaround method. With Computer Calls you’re able to call your Rebtel contacts from anywhere in the world using your regular Skype™ client. You initiate the call on the Rebtel website and use your Skype client to talk. As you’re calling directly over the Internet with Rebtel, you don’t have to pay a single cent for connection fees or high per-minute rates to Skype. Only the Rebtel rate. Computer Calls also allow you to get a local number for your friends Skype Name and call them on it from your regular phone. 1. Go to your contact list on the Rebtel website, click on the local number of the friend you want to call and choose the new “Call from your computer” option. 2. Your Skype client is launched and you will be connected to your friend. You only pay the Rebtel rate. So, the people who were not using Rebtel just because they wanted to make Pc to Phone calls can now go ahead and start using Rebtel Voip service. Rebtel has understood that they need to provide more ways to make calls. It has started offering voip client for all the smartphones (be it Android, iPhone, iPad, Blackberry). Rebtel has launched its official PC Application (its just a softphone which gets installed on your computer/laptop). We recommend using this application instead of the computer calling method we described earlier. Not a deal at all! I can make phone to phone calls for that rate with Pinless World! No messing with the PC or Skype!